Do you have little ones? Well I have a great list of books for you! 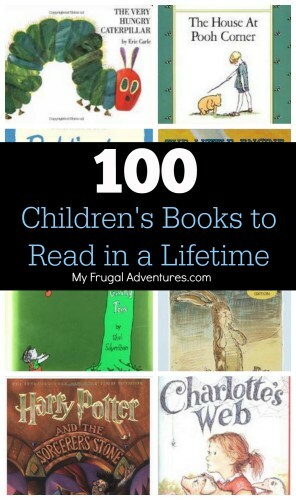 Here is a list of 100 Children’s Books to read in a lifetime. I think this is an excellent list to save for when you need baby shower gifts, birthday gifts or Christmas gifts. We have mountains of books in our house- we just love them- so I think these always make great gifts. Here is the list- note this was compiled by Amazon and Good Reads- there are chapter books and picture books so something for children of all ages. Click the title of the book and it will take you straight to the description so you can read more about it. And I can’t wait to hear what books you would add to this list? Any books you have loved recently? Do u have a printable copy of this list? I would love to be able to check them off as we read them. I don’t have a printable checklist. I did try copying and pasting into a word doc and that worked perfectly. You can print it out and then just highlight each title as you finish it. I would add any of the books from the Little Miss and Mr Men series to your list. What about “Old Yeller’? All three of my kids (2 boys, 1 girl) LOVED it. I know I saw the movie but I don’t think I ever read the book. I will add that to our reading list 🙂 Thanks for the suggestion Carla. I would add: The Little House by Virginia Burton, the Christopher Robin Storybook, by Milne, Margery Morningstar, and Cpwhy Christmas Trees Aren’t Perfect.